Animals (mostly birds) that can talk saying some funny, mostly crude but surprisingly poignant things. 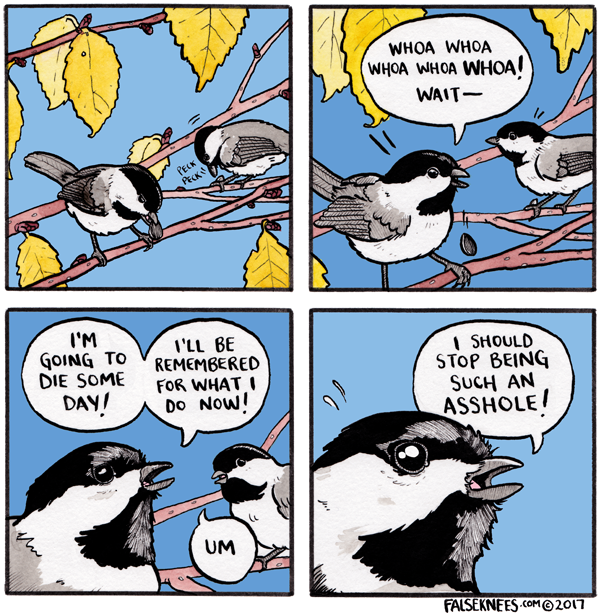 A bird that has more self awareness than many humans we know. A little potty humour and a potty-mouthed cat. Twice a week looks like. The art is amazing. Sometimes it's like reading Animal Planet meets South Park. Probably the one webcomic we spend the most time admiring the illustration and take it all in. There's a really good mix of humour and cleverness. Sometimes these animals say things that are way too realistic for our comfort. It's like looking into a mirror into my soul. Creepy but this is the charm. Bears. They don't talk, or are funny at all. But they will rip your face off. It's Bearmageddon!